Delta and United are two of the largest airlines in the world. The debate about which of these U.S. legacy carriers is the best airline for consultants continues to rage. To put that discussion to rest (or add some fuel to the fire), read on for our analysis informed by 15+ years of business travel on both Delta or United. Our rankings take into account business class, seating, lounges, food & drink, check-in experience, and in flight entertainment. So which airline most deserves your business travel loyalty? We’ll start with a Business Class comparison, since that’s where the majority of you will end up quickly (and for a much longer period of time). For Business Class, United takes the slight edge based on some of the key features important to business flyers. In 2016, Delta announced its Delta One suites would feature suites with fully closed off doors with bedding from Westin and an oversized duvet. The duvet has two options: a high-quality blanket and down-alternative pillow. The Delta One suite may be the best in its class, but only 20% of Delta flights currently feature this suite. United recently announced its refurbishment of its business class cabins and is moving toward a single uniform Business Class Product called Polaris. Polaris is currently in the midst of being rolled out, and as of publication, 36% of United planes have been outfitted with the new Polaris cabins. Polaris cabins feature bedding from Saks Fifth Avenue with a choice of two different blankets: a quilted duvet and a lighter throw blanket. Result: United for its efforts towards fleet wide consistency. Currently, you have more chances to be on a plane offering United Polaris as opposed to one offering the Delta One Suites. Both airlines boast an impressive and extensive connection of lounges across the world. United’s Polaris lounges are considered to be amongst the best among airline lounges, but fewer in number. Delta’s Skyclub lounges are more widespread but not as updated. If you want to skip airline lounges altogether, the Platinum Card from American Express gives you access to the premium American Express Centurion Lounges, Priority Pass network of lounges, and more. Otherwise, opt for the United℠ Explorer Card, which is offering a bonus of up to 60,000 miles until May 16, 2019. You’ll earn 40,000 miles after you spend $2,000 in the first 3 months and another 20,000 miles after you spend $8,000 total in the first 6 months. This offer will be available until May 16, 2019, so make sure you take advantage before then! Result: We give the slight edge to United, especially if you fly out of popular airport hubs (i.e. NYC airports, LAX, SFO, ORD) that have the updated lounges. Delta offers excellent food, with seasonal and regional entrees featuring fresh ingredients and flavors. Delta’s master sommelier – Andrea Robinson – selects wines from around the globe, including regional selections paired with onboard meals. United Polaris customers receive a multi-course inflight dining experience designed by chefs from The Trotter Project, a nonprofit organization committed to mentoring and internship programs for youth interested in the culinary arts. The menus rotate every month, so you’ll continue to have new dishes to experience on board. Result: Tie due to a lack of clear differentiation. Even though you’ll eventually start clearing frequent upgrades, you still have to endure the Economy product for a bit. Based on our comparative analysis on the key features important to Economy Class customers, we believe that Delta offers an overall superior service than United. Result: Delta for overall better experience. If you’re not an elite Delta Medallion, you need the Delta Reserve for Business Credit Card. You’ll earn 40,000 bonus miles and 10,000 Medallion® Qualification Miles (MQMs) if you spend $3,000 in the first 3 months, and additional bonus miles if you hit higher tiers of annual spend. Plus, you receive Main Cabin 1 Priority Boarding and free entry into the Delta Sky Club. When it comes to the seats, both airlines offer the same amounts of space (which is to say not much) , with roughly 17 inches for seat width and 31 inches for pitch across Economy class in most planes. The good news? You won’t be in Economy for long once you reach United 1K or Delta Platinum Medallion status. Result: Tie due to no clear differentiation. Both airlines charge similar rates when it comes to checking in bags (see Delta’s fees here and United’s fees here). However, Delta allows one carry-on that’s no larger than 22 x 14 x 9 inches and one personal item, while United only allows one personal item no larger than no larger than 9 x 10 x 17 inches. Any additional items must be checked at ticket counters, and if you take your bags to the gate you’ll pay a $25 gate service fee per item plus the applicable checked bag fee. Result: Delta is the clear winner here for allowing a free carry-on. Basic Economy class (which you should never opt for if you’re trying to accrue status) for Delta and United offer similar check-in experiences, with the main difference being that Delta allows all customers to check-in online. United only allows customers to check-in online if they are checking in a bag. If you’re not checking a bag, you’ll need to finish checking in at the airport to prove that you don’t have more than one personal item. For standard Economy, you’ll have the same experience, although we love the redesigned United app. 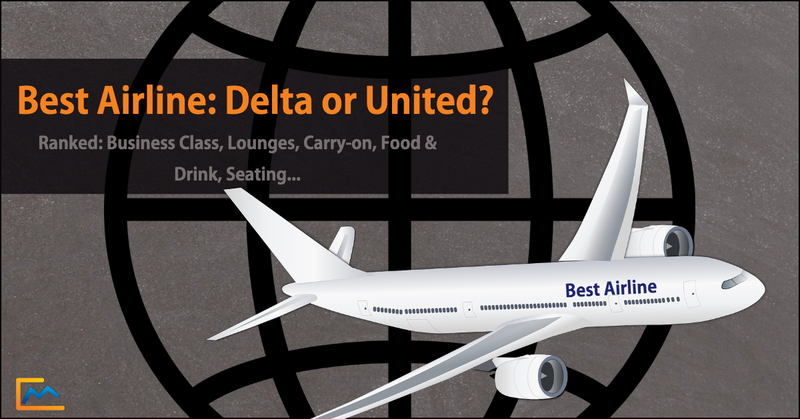 Result: Delta slightly edges United here for the online check-in optionality for Basic Economy tickets. Otherwise, this is a tie. Delta Airlines states on its site that only flights over 250 miles come with complimentary snacks, while United Airlines is happy to offer snacks on every flight regardless of the mileage. However, Delta also offers a free meal on select trans-continental routes. Both airlines offer meals and snacks for purchase with similar varieties and price ranges. Result: Tie due to similar offerings. Here’s where it gets interesting. Delta boasts one of the best entertainment systems across the majority of its Economy class seats for free, while not all United planes offer seat back entertainment. United instead opts for personal-device entertainment services, which, if you have a crisp iPad Pro, may be a big plus for you. Delta is known to be one of the most connected airlines in the industry, lapping United when it comes to Wi-Fi speed and reliability. Result: Delta easily wins here with more entertainment options across its flights and better accessibility to Wi-Fi. Based on our comparisons, we think the choice is pretty simple – Delta wins Economy and United wins Business. However, of course there is always more that comes into play, like which airport is your home airport, how much you value loyalty programs, and your consulting firm’s airline expensing policies. We’d love to hear some of your thoughts in the comments below! Our rule of thumb: go with the airline that has hub operations at your home airport, or that offers the greatest number of connections to a nearby hub. If you live in a city that is a hub for multiple airlines (NYC, LA, Chicago), we’d give the slight overall edge to United.